Focus & Scope Jurnal Penelitian dan Evaluasi Pendidikan is a showcase of original, rigorously conducted educational measurement, assessment, and evaluation. The journal particularly covers manuscripts within the following areas: Instrument development, Performance assessment, Testing management, Program evaluation, Policy analysis, and Research methodology development in educational settings. OnlineFirst articles are the articles accepted for publication and published prior to their appearance in an online or printed issue of the journal, in order to disseminate the most recent research as soon as possible. The Editorial Team of Jurnal Penelitian dan Evaluasi Pendidikan has categorized your submission into two: Active and Archived Submission. Active submission means that your submitted manuscript will be subjected for review process. If your submission status is Archived, it means that your manuscript is declined. Please notice your submission status. 2019: only English Manuscript will be procceseed! 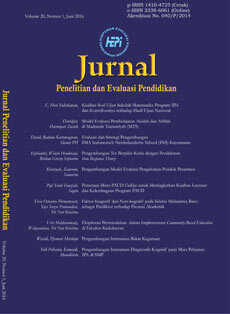 Dear Authors, in the efforts of expanding dissemination of Jurnal Penelitian dan Evaluasi Pendidikan (JPEP), the Editorial Team informs that starting from the publication year of 2019 and the forth, JPEP will publish the articles in English. Therefore, since this announcement is published, any non-English manuscript submission will be automatically rejected. Note: for authors who have already had an active submission in the journal, it is informed that the Editorial Board still provides a chance for the submitted manuscript to be processed further. However, if the manuscript is finally accepted for publication, the authors are then required to translate the non-English manuscript into English in reputable translation center.